Futures are being pushed around by the normal push-pull of the rumor mill out of Europe - it has reached the point of jump the shark. Late yesterday the market rallied for about an hour on news of a second bailout fund to run along the already mocked ESFS. Then the question of how it would be funded came to be asked, and the market sold off. It's just trial balloon after trial balloon. Tomorrow (morning for Americans) we hear what the ECB is doing with interest rates - a cut is expected, but will it be 25 or 50 basis points and most important are there any 'additional cookies' to be handed out to the class of unruly 2nd graders demanding Oreos by the dozens. Then Friday everyone awaits a new bazooka. As a trend trader if these moves were spread out over 10-12-16 weeks it would be quite possibly the best environment possible for those who have the ability to flip the switch from unhedged to hedged, but the fact almost all these moves happened in 5-7 market SESSIONS is simply jaw dropping. 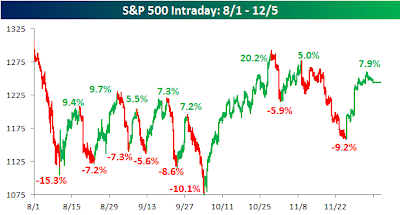 (also recall much of the action is Europe driven so many of these moves were mostly made in premarket) You can't even begin to get into positions before you'd be stopping out... and then two weeks later trying to chase back in.... and then be stopped out again. The only winner is the broker collection the commissions. Which is why sometimes you just have to stand on the side of the road.... be boring... and wait for a more sensible period. In the end the market has gone nowhere since Aug 1.... but the journey to nowhere has been neck snapping.